Such were the words uttered by Legendary jazz musician Clark Terry (who taught Quincy Jones and mentored Miles Davis) to his latest young protégé, blind 23-year-old pianist Justin Kauflin, every time they said good-bye. In this thoughtful documentary of the same name, Keep On Keepin’ On is the story of their touching and enduring friendship. After my friend and I sat in the theater for 15 minutes post credits, I came home and added both Terry and Kauflin to my Pandora playlist. Inspired to tears, I highly recommend it. As some may know, I love the movies. I often go alone and am drenched in the dialogue, inspired by the sets and captivated by the costumes. I get this love of cinema from my mom, Elaine, whom I think has great taste in movies. As the weather gets colder and long winter nights encourage us to escape the dreariness without leaving our homes, I gift you with some of her favorites. And as she would encourage, so do I — pour a glass of wine, pop some popcorn and pull up your favorite blanket. May you find inspiration, motivation or simple delight in one of her recommendations. What movies have MindFULLY delighted you? Let us know! “Be of Ease” is the quote my mom uses when signing off her emails. With the Holidays upon us, we hear a lot about giving gifts. While I want for little in the “Stuff” department, there is something I pray to receive. Perspective. For me, Perspective is the greatest gift. It’s free. I can give it to myself and I can share it with others. It brings with it the Ease my mom wishes for us, Humor and Forgiveness. And I love those guys! Boy, what we could do with 10%. The anxiety level in our house is kinda high right now. Suffice to say, I am blessed with a high school Junior who is determined to do well at whatever she sets her mind to – and her mind is on overload as she juggles the next two weeks (after juggling the last month) and heads toward Finals, the State competition for one of her favorite and most time demanding classes (which happens to fall on the first day of Finals, moving some of them later into the week – which only adds more stress) and a recent realization that she will need to study over the holidays for college tests this Winter/Spring. No rest for weary Juniors the country over. These are “first world problems” as “They” wisely say. Nontheless, managing the stress of so many balls in the air, can get to even the most seasoned handler of us all. “Once a cheerleader, always a cheerleader” and so, all I can do is cheer her on. Even tho’ I can’t pull my old skirt up past my knees, I can find ways to show I am on her team. 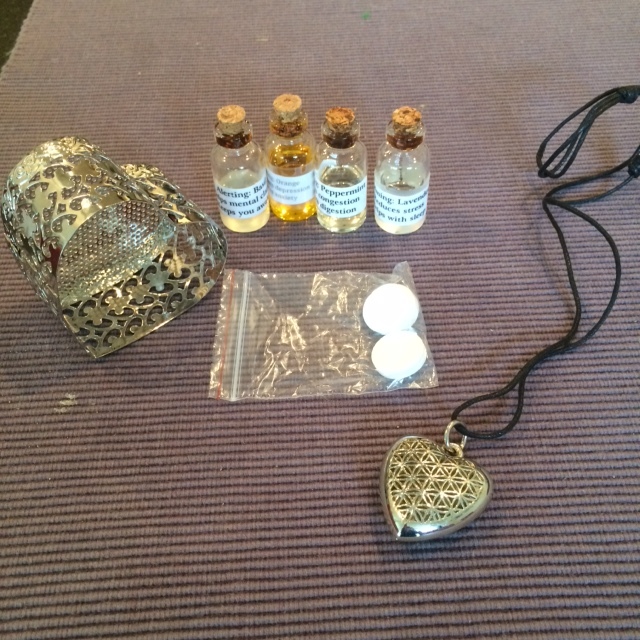 I made her a Junior Year Stress Relief Kit for her backpack filled with Rescue Remedy, lavender oil, Emergen-cee’, protein bars and a cotton ball. A lovely mom we know gave her this beautiful stress relieving aromatherapy necklace; she had it leftover from her own daughter’s Junior year. My intention is simply to offer a variety of touchstones to bring her back to a deep breath. With breath comes perspective. And sharing that learning is all I can do for her. Everyone seems to have his or her own version of stress right now. Some friends are dealing with their own illnesses, others are dealing with aging parents, kids in school, kids out of school, work demands, family dynamics and holiday thorns. No one seems immune. 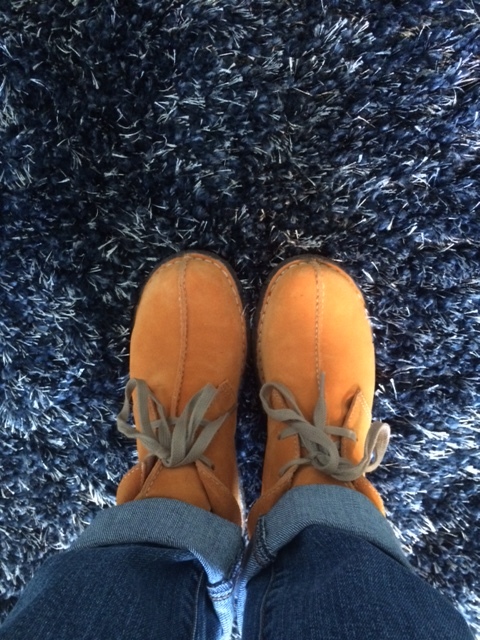 However, in an effort to inoculate myself from taking it all in, today I am sporting my happy shoes – my metaphor for taking a step toward finding my own way (I think it will be downloading Dan’s book to my iPad). How do you find MindFULLY find what you need during stressful times? Have you ever been thinking of someone and they call? Or you open a book and read a passage that takes your breath away and teaches you in that moment, something that shifts your energy? Or you think someone has it so much better, and they reveal a detail that reminds you that everyone has a battle to fight? I call those moments, “G-dwinks. I’ve written about G-dwinks before. I thought it was a phrase my wise and thoughtful cousin, Evan, made up (Even tho he never said he did, it was simply my assumption in his short, but profound description of the concept). So, imagine my surprise when a few weeks ago, I saw a story on my favorite TV Show, CBS Sunday Morning with Charles Osgood about SQuire (yes Q) Rushnell and his book, When God Winks at You: How God Speaks Directly to You Through the Power of Coincidence. Wow. Seeing the show, on that day, and learning about the book series…well, I think it was a G-dwink! According to Rushnell, a veteran ABC Network Television executive who has seen a lot and created even more, “The stories in this book reaffirm that g-dwinks happen to everyone. We just need to learn how to see them.” It goes on, and honestly, gets a little religious for me. But, in the spirit of “take the best and leave the rest”, I love the concept. Check it out at www.godwinks.com. If nothing else, perhaps it will simply offer another way for you to view the happenings and people in your life; and through that lens, you might come to realize that no matter your circumstance, there is something for you to learn. How have you MindFULLY made sense of coincidences in your life? Normally I post on Mondays, (MindFULL Mondays), but as we set the clocks back one hour, I had to find a way to make the dark, cold nights upon us, warmer. So this morning, as I woke up to the bright sun at 6:30am and thought about my day ahead and what to make for Sunday dinner (it’s in my DNA) Souper Sunday came to me. With a strong need to warm my insides and out, I am planning to have a grand time finding one soup recipe to make every Sunday afternoon (that I can) and one quote to hold as my intention for the week. To kick off this new Winter tradition, I have chosen my friend Jane’s recipe for Butternut Squash and Leek Soup. Easy to make and delicious! Melt the butter in a large heavy saucepan. Add the leeks, celery and garlic and cook over moderate heat, stirring occasionally until softened. Add the stock, squash, tomato paste an bay leaf. Season with salt and pepper and simmer over moderately low heat until all the vegetables are tender about 25 minutes. Discard bay lea. You can leave in or remove the parsley. Puree the soup. Taste for seasoning. I love her. She is a wonderfully wise, loving and cool mom. 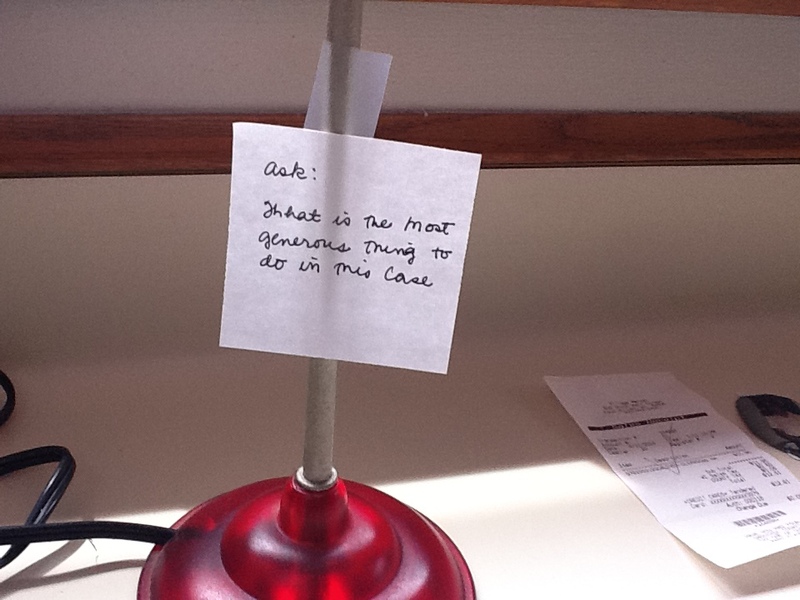 The rooms in her beautiful home have quotes on post-it notes tacked to the fridge, walls and bookcases. I always leave her having learned something I am the better for knowing – and feeling warm, inside and out. How do you MindFULLY deal with the cold, dark afternoons of Winter?